You are here:Home » Product Reviews » Giveaway: Brand’s InnerShine RubyCollagen Essence + Strip Worth $93!! Have you always wanted to try a collagen booster? What’s your thoughts on BRAND'S® InnerShine #RubyCollagen Essence? Just recently, I received 8 boxes of BRAND'S® InnerShine RubyCollagen Essence for my review. Now, I’m pleased to share the beauty of this collagen drink with you. Thanks to BRAND'S®, 3 readers will walk away with 1 set of BRAND'S® InnerShine RubyCollagen Essence (SGD 57) + BRAND'S® InnerShine RubyCollagen Essence Strip (SGD 36) Worth SGD 93!! Aren’t you excited? All you need to do is answer a simple question below & the 3 best answers will win!! So start putting on your thinking cap! * Important: Follow all steps or your entry will not be valid! “Follow This Blog Via Email” located on the right-side of this blog to have the winning announcement delivered right into your mailbox. Announcements will only be posted here & in Facebook, G+ & Twitter. Tell us “Why you wanna try BRAND'S® InnerShine RubyCollagen Essence?” Post your answers & email address in the comment box below. Do not sign in as "Anonymous"; type in your name! Click on the pix above & it'll bring you to a similar pix in #Facebook. Share the pix on your wall; copy & paste your earlier answers in the sharing box too. Make sure it's set to Public so we can see it on your wall. Contest begins 14 Aug 2013 & ends on 31 Aug 2013 @ 10 pm. Judging is by BRAND'S®, & decision is final. Disputes will not be entertained. Results will be announced within 2 weeks. Winners must be able to collect their prize at Cerebos Pacific Ltd @ 18 Cross Street #14-05/12 China Square Central (048423). No further emails will be entertained once the winner has exceeded the 48 hrs as spelt out in the rules. It’s the participant’s responsibility to check the announcement of the giveaway result. Good luck! Thank you BRAND'S®, for all the awesome goodies! I want to try Brand's InnerShine RubyCollagen Essence because I want a radiant, bouncy, smooth, and wrinkle-free skin. So sad. I am a Malaysian! Sobs! Sobs! My face will not get to shine. Sobs! Sobs! TM, any relatives in SG to take part for u?? Hahaha! I need it for my skin to be look young and beautiful. I was down with flu for a month. Now I need Brand's InnerShine Ruby Collagen Essence to restore and boast my skin radiance! Thank you Shirley for another wonderful giveaways! I wanna try Brand's InnerShine RubyCollagen Essence because I need a supplement to restore and maintain my skin suppleness, firmness and elasticity. I Never Try RubyCollagen Essence..Hopefully I Can Get To Try,Taste & See Result for Myself! Heard lots of great reviews from others saying how amazing collagen does to their skin. But never have the chance to try it out.Hope i will be a little lucky this time to win. I hope to get pamper by Brand's InnerShine Ruby Collagen and to get a chance to get bouncy skin like yours. That's why I never get enough of Luxuryhaven - always sharing all the goodies that you are being pampered with, with your readers too. DS, thks again for being such an ardent fan for so many years! I really love how it packaging are, it so handy that you could just bring along when you out to work, or even holiday! The essential nutrients delivers effectiveness to makes one look younger and healthy! Thats what a mommy will need it! I want to be healthy and of couse been young so that it makes me more enegertic to get all bonding done with babies! Thanks for such an awesome giveaway!! As I aged, my skin ages too. I hope Brand's InnerShine RubyCollagen Essence will aid me to age gracefully into a pretty auntie and into a grandma. It's always my wish to grow old and look beautiful with a radiant, smooth, bouncy and firm skin. I want to win because i want to stay pretty with Brand InnerShine RubyCollagen Essence. BRAND’S® InnerShine® RubyCollagen Essence is uniquely formulated for Asian skin to retain skin suppleness and reduce the appearance of fine lines. I believe the Brand's InnerShine Ruby Collagen Essence will help me get back the kind of youthful healthy smooth, radiant, firm and hydrated skin. Lovely giveway. My sis-in-law works in Brands (Malaysia) and I usually pinch the products from her. Nava, you're making a lot of people envy! Lol! I would like to find out whether BRAND'S InnerShine RubyCollagen Essence and BRAND'S InnerShine RubyCollagen Essence Strip would be a tasty yet nutritious treat for myself. I would love to have this as i know that Brands always offer quality products to their consumers, and such to be consumed beauty products are the rave now. Sadly, with kids in universities and not a lot of spare cash lying around, a wife gradually become a housewife due to the lack of self pampering and innershine. Hahahs! That speaks for me la. Well, would be great to win this and be a tai-tai for once. Thanks! I have been searching for the perfect supplement for my skin. BRAND'S InnerShine RubyCollagen Essence and BRAND'S InnerShine RubyCollagen Essence Strip Would sure be the best supplement for me to begin with. I have never tried any sort of collagen. From all the great reviews I saw on the internet on the BRAND'S InnerShine RubyCollagen Essence and BRAND'S InnerShine RubyCollagen Essence Strip, I would really hope to try out this products. I would like to try this for the benefit of my skin. Get ride of free radicals, look and feel younger. Support BRAND's always! I want to try Brand's InnerShine RubyCollagen Essence so that I can have beautiful and smooth skin. I have never tried taking supplements like these. I would love to have the chance to try it and witness the effects it might have on my ageing skin! I will like to try BRAND'S InnerShine RubyCollagen range, knowing that Collagen helps to maintains the skin elasticity. Reduced skin elasticity is a fact of aging for most people and finding the right products to introduced to the body can be tricky. I have already tried it but I want to continue drinking it! Astaxanthin, the most powerful antioxidant in the world right now..I saw how it strengthened the membrane of an egg and prevent the yolk from bursting easily like a normal egg would. I believe it will strengthen the structure of my skin and further boost my health. Anyway I fed one bottle to my old and disabled pet bunny which made him more energetic. Best of all, he simply loves the taste. LOL! I would love to try Brands InnerShine RubyCollagen as I trust Brands products. InnerShine RubyCollagen is great to keep the skin supple and glowing which is exactly what I want! I would like to try to retain the suppleness of my skin and see how this product works miraculously! I love this brand of product is because it gives us a healthy and refreshed look.. Forever stay young. It also give the skin more supple and look more radiant and glow. I have oily and combination skin (oily T-zone but dry cheeks)and I don't see obvious improvement after spending so much on the skin care products. I would like to try the Brand's InnerShine RubyCollagen Essence as I believe it's important to nourish my skin from within. I want healthy radiant skin!!! I want healthy and moisture skin. Pls choose me. I NEED to boost my collagen and regain my skin's lost bounce. mich.ang.xp@gmail.com. I love to have the Brand's Innershine, Ruby Collagen Strip because it is healthy and help in the building of collagen. I seriously love the taste also!! My love one birthday coming in few days time. I hope to win Brand's Innershine, Ruby Collagen Strip for her to stay healthy and young. I heard very good reviews on Brand's InnerShine RubyCollagen Essence, thus I would love to experience for a magical and miraculous change to combat the signs of my aging skin. I have always been consuming Innershine Berry Essence with Grape Seed Extract every morning before i leave home for work.It helps to maintain my skin elasticity and allow better blood circulation for a radiant glow from within. Most importantly, they protect my skin cells against all the UV Rays and pollution when I am out from "shelter", either from home to work or during lunch time. Hopefully I can be one of the winner and bring this wonderful collagen drink home! Woww what a wonderful Giveaway of an amazing product. Health is the most important perspective of everyone's life. Brand's product not only make sure that along with health one will have Radiant Beautiful Skin. Healthy skin itself is the REFLECTION of one's Inner Good Health. As a new mom blessed with all the happiness, I am also having tiring day & sleepless nights. Recently some one told me your skin looks too dull get some collagen treatment & here it comes..I like to try it to get a new radiant healthy skin & once My hubby can see the result He will himself buy this product for me :) Keeping finger cross.. 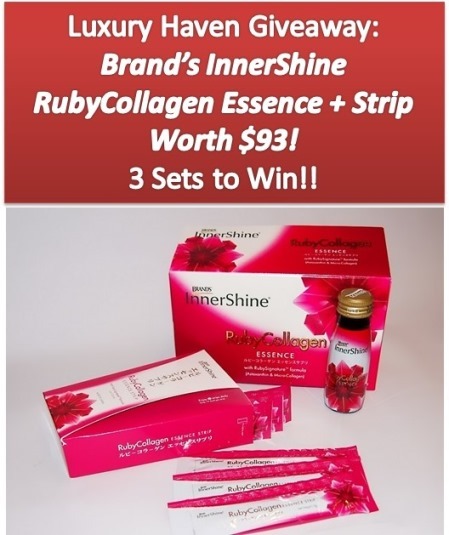 I will like to win this Brand's Innershine Ruby Collagen drink gift set for my mum who have put in her heart and time over all these years to nurture us. I hope this product can help her maintain her beauty and continue to be a confident happy working mum and wife.